For starters: There is no such thing as a completely accurate map of wolf packs. Packs break up and form all the time, and they can change location. 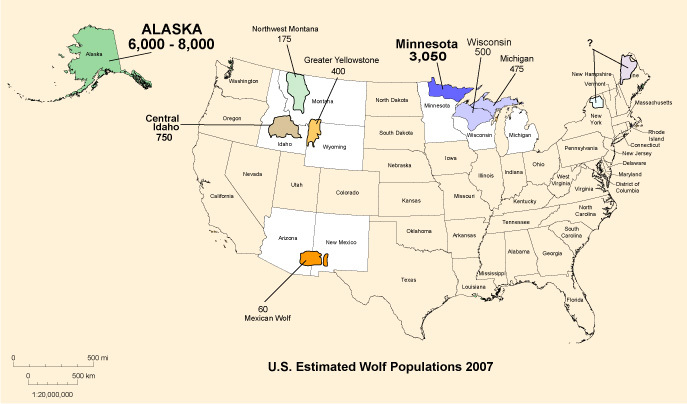 Most recent data is from 2007, so it’s already many months old, but the map can still provide a reasonable overview of the dispersal of wolves in the Greater Yellowstone Ecosystem. How many wolves are enough / too many? The "wolf wars" are back in federal court. This time it is a coalition of environmental and animal rights groups seeking to reverse the recent delisting of the gray wolf as an endangered species in Montana, Wyoming, and Idaho, and to halt state management of wolves. The argument over delisting wolves goes back years, but legal action waited until the delisting was implemented (rescinded, then re-instated...) and wolves were being killed as a result of delisting. This promises to be not just a war of words, but a legal battle of scientific data -- who's got the most persuasive science.